Beirut has always been loud – not just in terms of sound, but also in its sense of self. There’s lots of extravagance, sometimes snobbery. There’s history, heritage and the remains thereof. And yes, at street level you’re bound to encounter a symphony of noise: honking (ranging from the musical blares of 16-wheelers to the squealing yelps of deteriorating taxis), street vendors broadcasting, neighbors gossiping, children playing and of course the deafening, unyielding spectrum of construction sounds. It seems like Beirut is in a constant state of construction. Through its various epochs, the city has undergone cycles of building, demolition and revival. 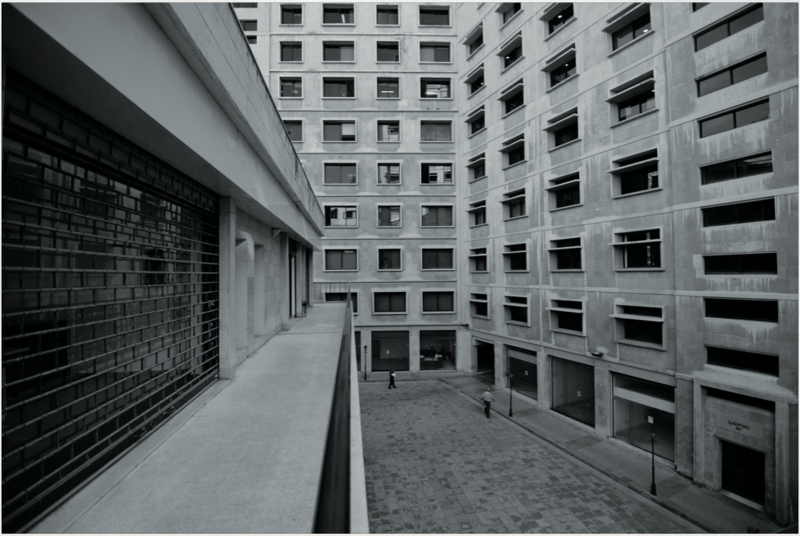 In modern times, beginning in the 1920s when concrete first made an appearance in the country, a new Modernist Beirut began to rise. Modernist architecture emphasizes the quality of interior space (so exteriors are often neglected), natural lighting, ventilation and public spaces, though critics accuse it of being a “copy-paste” style that disregards local tradition. By the 1950s, post-independence, the new nation was advancing as the regional capital of avant-garde. It was the scene of urbanization, industrial development and a rapidly expanding economy. 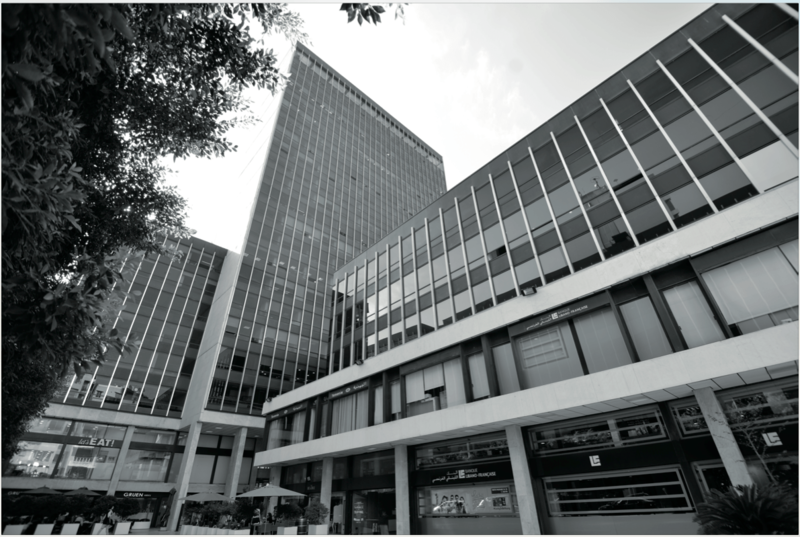 Modernism was in full swing and internationally renowned architects as well as a new generation of local architects were leaving their marks on the cityscape – especially on a number of remarkable office and administrative buildings. The nascent government commissioned buildings such as the International Fair of Tripoli to Oscar Niemeyer, the Banque du Liban headquarters and the presidential palace to Addor & Julliard, and more. The country was a cosmopolitan hub and design was a reflection of the times. It all came to a screeching halt in 1975 with the jolt of civil war. Many golden era gems were pummeled with bombs and pierced with bullets; others were altogether demolished – there are countless sad stories of architectural ingenuity reduced to dust. Some of those still standing today have faces scarred by shrapnel, but the once-greats are not have-beens. Rather, they are permanent reminders of Lebanon’s heritage and pre-war greatness. If their walls could talk they would tell you – loudly, in true Lebanese fashion – that this is what Beirut was preparing to become, what it could have been and what it was robbed of. 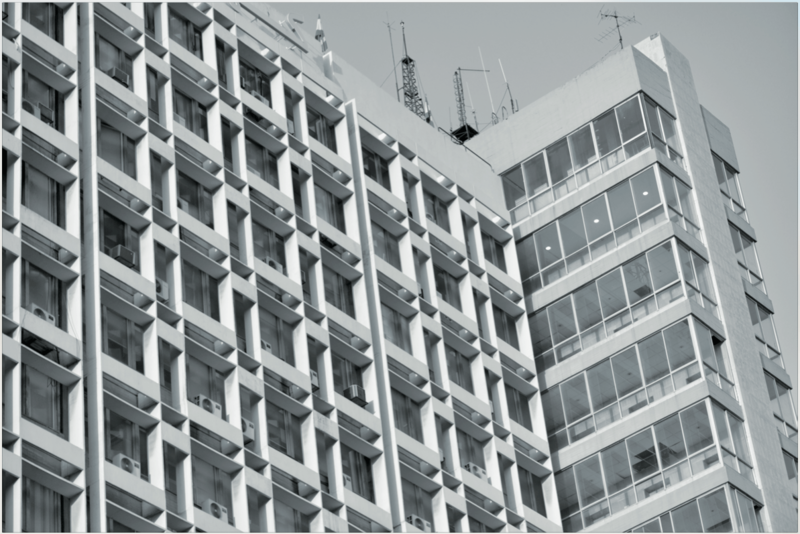 Take a virtual walk with Executive life through Beirut’s most notable Modernist office spaces. Pioneer architect Gruen is known as the “inventor of malls” in the United States. In Lebanon he left his mark with the giant Gefinor Center, a 55,000 square meter business complex with five blocks and a large area for retail and restaurant spaces on the ground floors (two ground floors because it’s on a slope). It was one of the first structures of this size in the Middle East and is equally impressive today. Lebanon’s electricity may be a national joke but the building housing the institution’s offices in Mar Mikhael is a serious work of architecture. This progressive design by CETA (J. Aractingi, J. N. Conan, J. Nassar and P. Neema) was chosen in 1965 as part of a competition – a popular practice that gave rise to many young architects. Two years later, construction began on the well-thought-out winning entry, which boasts sea-views, an urban space for the public and large claustra veils that block direct sunlight on the south side. Before they designed the government’s central bank building in Hamra and the presidential palace in Baabda, the celebrated duo was commissioned to create this massive multiplex on the western end of downtown Beirut. Its location is surprising for its time, as it was not a business hub. The center is designed so that a street runs between the towers, and like Gefinor it’s set on two street levels, which increases ground-floor commercial space. The L-shaped multipurpose complex was designed by the famous Finnish and Swiss architects and is remarkable in the way it creates an inviting urban space with a fountain, benches and greenery. Standing on the corner of Hamra and Rome streets, today it is the headquarters of Fransabank. 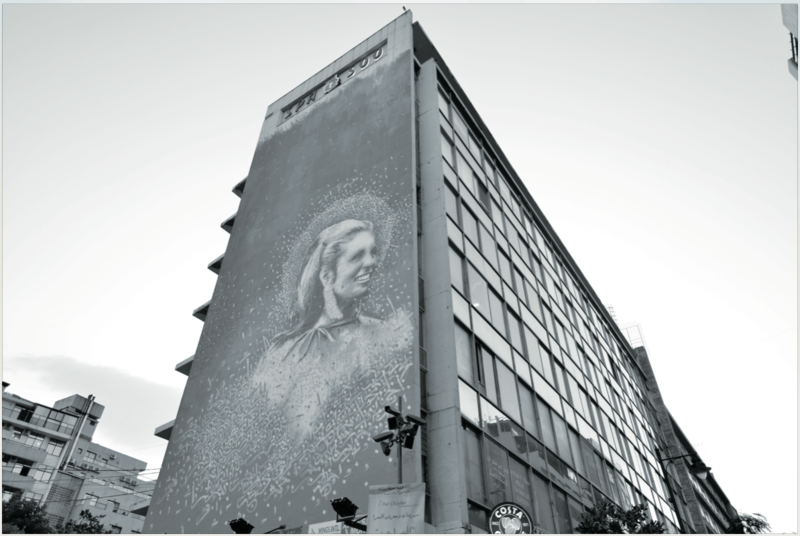 Today a graffiti mural of Sabah garnishes this once-avant-garde building in the middle of bustling Hamra. 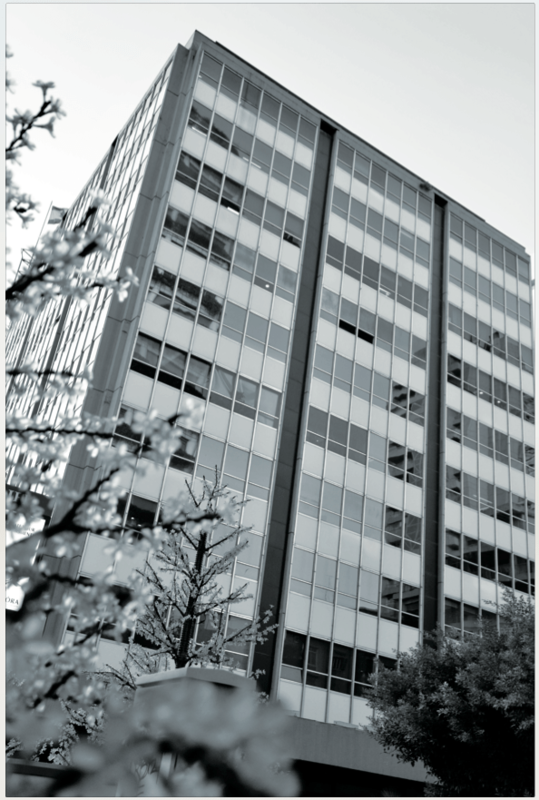 It’s often called the Horseshoe building, referencing a famous intellectuals’ café once on its ground floor – years before Costa Café occupied the space. 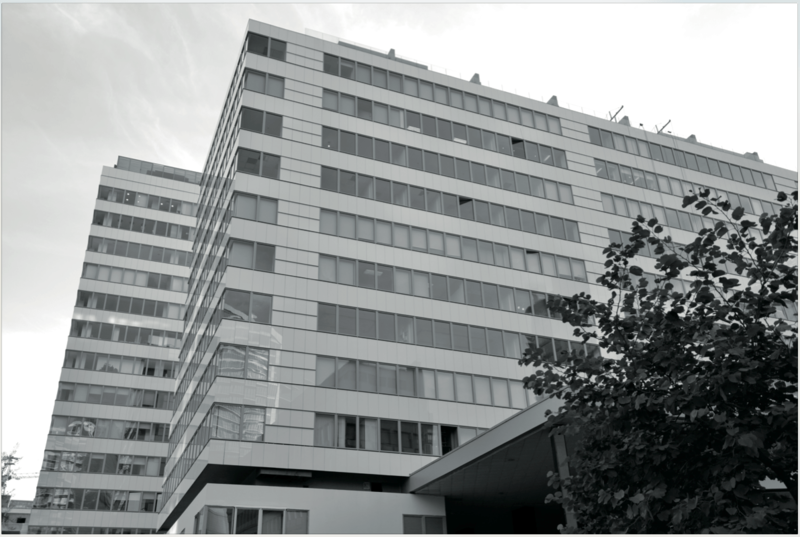 The building itself, designed by Polish architect Schayer, was the first in Lebanon to have a glass curtain wall, a then-new technology where exterior walls consist of an aluminum frame filled with glass. Also referred to as the Azarieh building, this is a prime example of urban design with a central plaza. Though it’s rather simple, it was one of the first modern structures in the city and is quite a departure from the galleried spaces and ironwork just steps away on Allenby and Foch Streets. Award-winning French architect Leconte was also commissioned to design the Beirut International Airport at Khalde (1948-1954). A young Romanos won the competition to design the headquarters just after graduating from the Ecole des Beaux Arts in Paris. 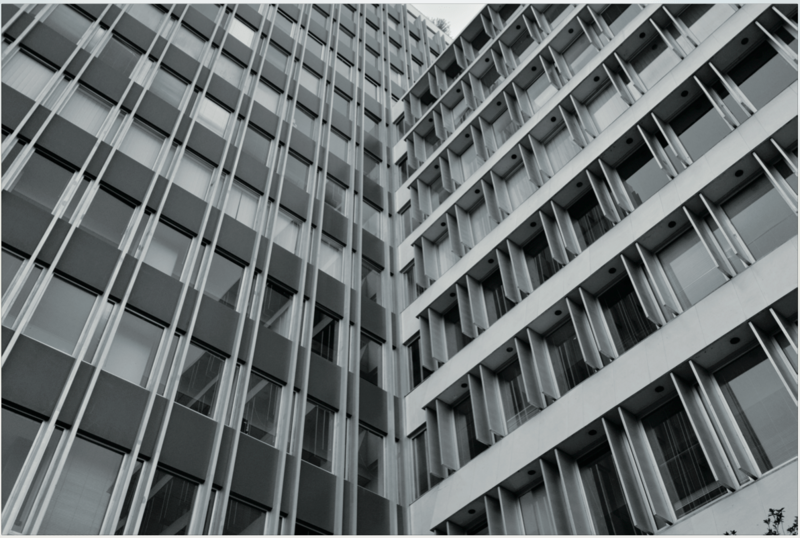 Its façade is minimal, and one of the most interesting things about the building is actually the interior, which is based on a grid that allows for the freedom of partitioning of spaces. Not quite an office building in the traditional sense, instead this is a showroom – and a smart one at that. Renowned Lebanese architect Khalil Khoury began construction on the Interdesign Showroom at the outbreak of war, pausing during the conflict, and finishing years after its end. 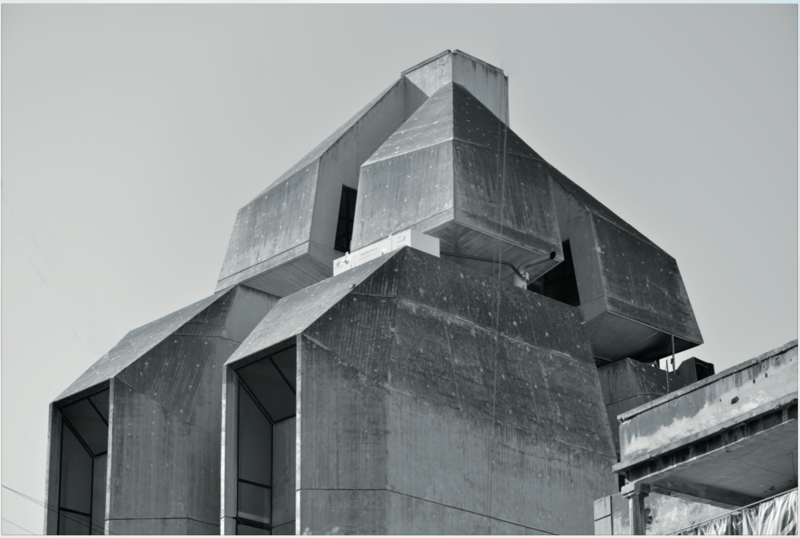 The Brutalist exterior intelligently blocks direct sunlight at peak hours while flooding it with natural light and its interior space is the epitome of functional space, optimizing the view of showcased objects. 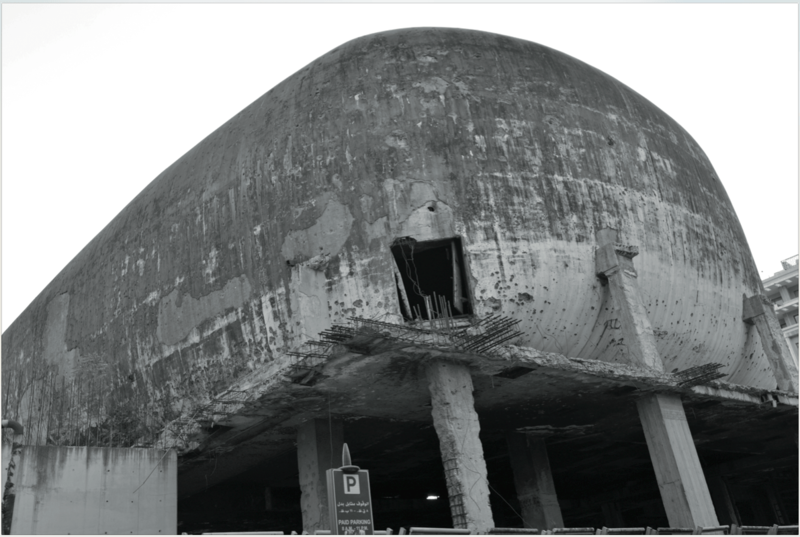 Better known as “The Egg” and sometimes “Sabouneh” (soap), this structure was actually a cinema theater, notable in that it is not underground like the rest of the cinemas at the time, and planned as part of a complex. Another part of the center was developed as an office space and met its fate with a bulldozer in 1997. The cinema part of the Le Corbusier-inspired structure, typical of Karam, still stands but its future is uncertain. Plans range from destroying it to make room for new developments to preserving it as a somber reminder of the war. Special thanks to Dr. George Arbid and the Arab Center for Architecture for their contribution to this feature.